No one signed up for Monday and no one signed up for Tuesday. 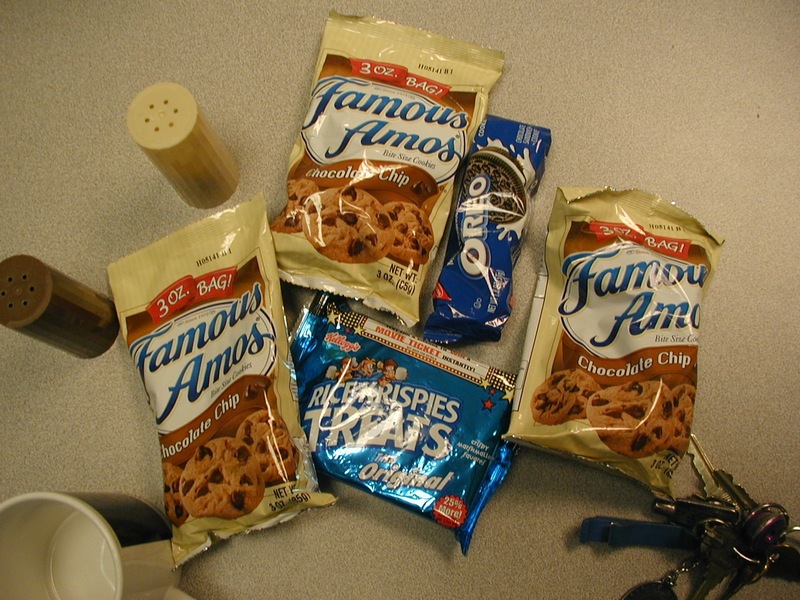 Fortunately when we raided the machine we noticed that there was a large number of Famous Amos cookies in one of the slots and the 3 oz size to boot! So we were able to satisfy our sweet teeth with something respectable. Famous Amos cookies aren't that bad. 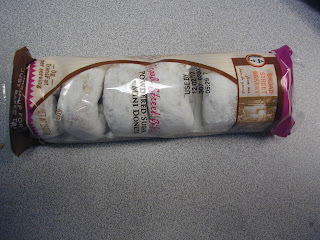 On Monday we supplemented it with a random pack of sugar frosted donuts form the "Broad Street Bakery" wherever that is. On Tuesday we included a pack of Oreos and some Rice Krispies Treats. Oreos are Oreos so no complaint there, the donuts were as they were expected to be but the commercially prepared Rice Krispies treats were God awful! 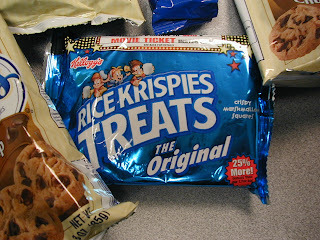 They can best be described as sickeningly sweet with the Krispies seemingly predigested or mashed. 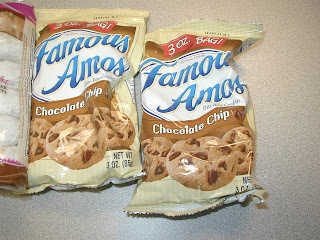 Anyone who had these things growing up as a kid here would be appalled at how bad they are. Our European friend who was trying them for the first time was not impressed and it took some reassuring that the homemade version is much better. 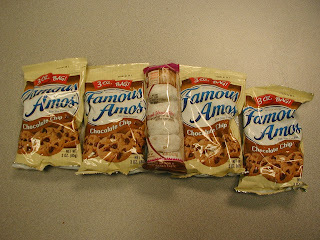 The 3 oz package is actually a respectable amount! Original my foot! Stick with the ones that Grandma makes at home! But enough is enough! Since we couldn't rely on pure volunteerism to fill in the cake calendar a little arm twisting was done and in about five minutes we got the calendar filled for December. 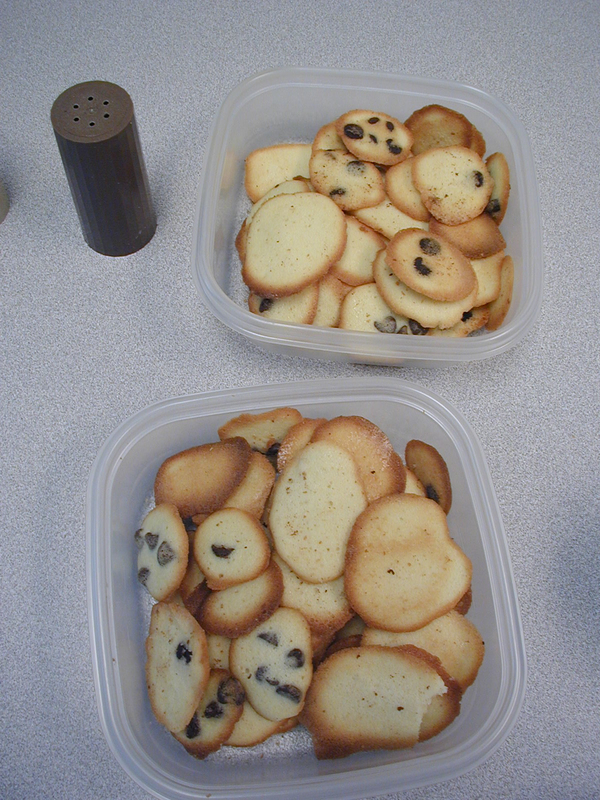 Next week has even been dubbed grad student cake week because all the slots were randomly taken by graduate students. Let's see what kind of competition that turns out to be! 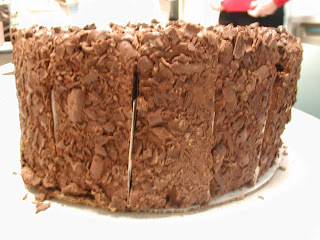 We thought we had seen some pretty intense cakes but this one was quite a confection er concoction. Everyone has heard of '"Death by Chocolate" as a description of a sinfully chocolaty dessert. 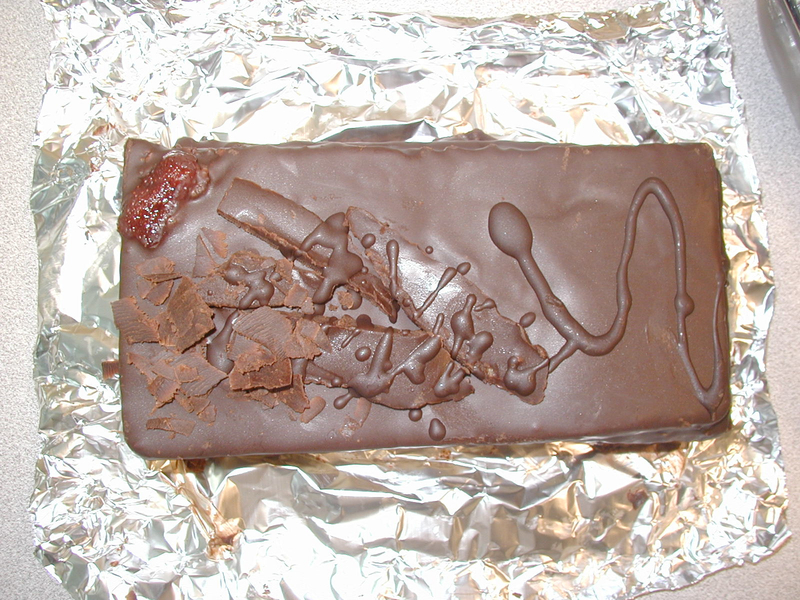 Well this thing was so over the top that we dubbed it "Mass Murder by Chocolate". 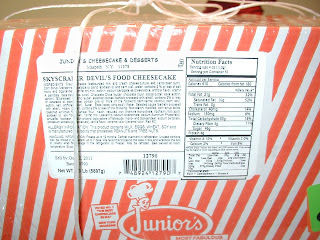 The official name is "Skyscraper Devil's Food Cheesecake" made by Junior's Most Fabulous Cheesecake and Desserts. It was about 6 inches tall and about 15 inches in diameter. The cake was cut into 14 slices but sticking to the suggested serving size would accommodate 52 people. 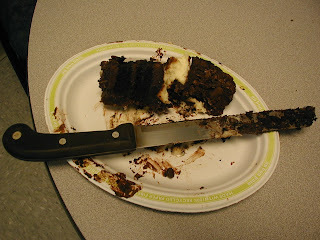 This was basically a devil's food cake on top of a New York cheesecake. And Junior did not skimp on any ingredients. 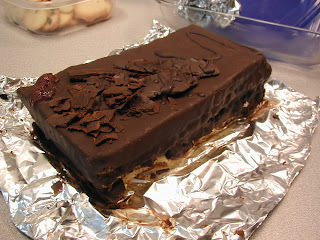 This was one rich cake. We ended up serving about 5 people per slice because it was truly a lot to consume. 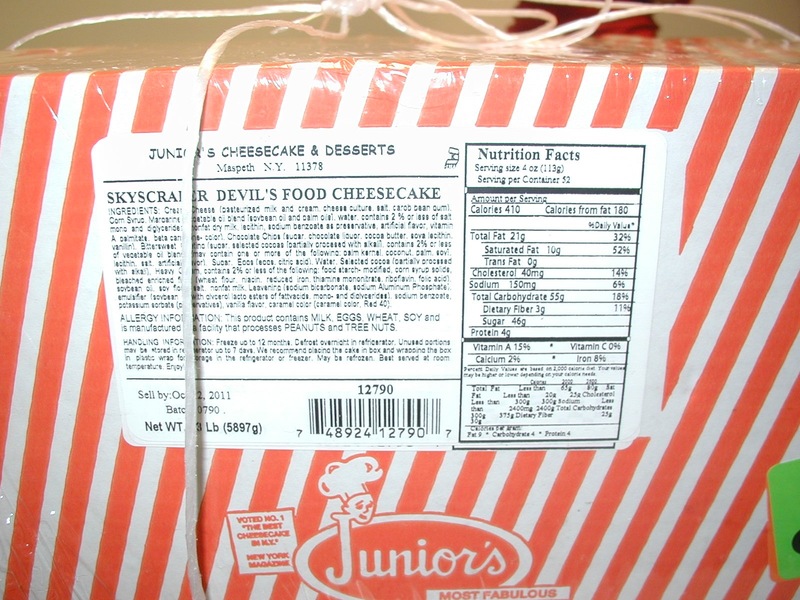 We learned quickly that this cake was best eaten in small doses because a large slice would at the minimum provide the daily recommended caloric intake for an average person. All wrapped up and waiting.. When there are 52 servings in the box..something is up! 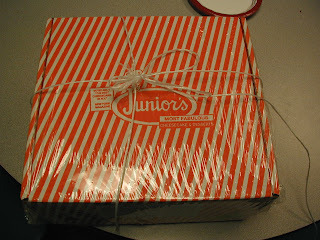 Only 14 slices were cut..it was impossible to eat one. A Devil's food cake on top of a cheesecake...who thought of this? 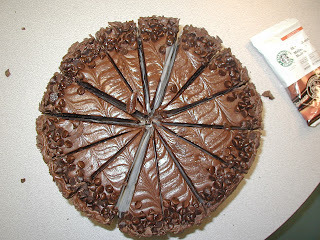 It took about twenty people to get through four and a half slices. That did not stop a few of us from trying. 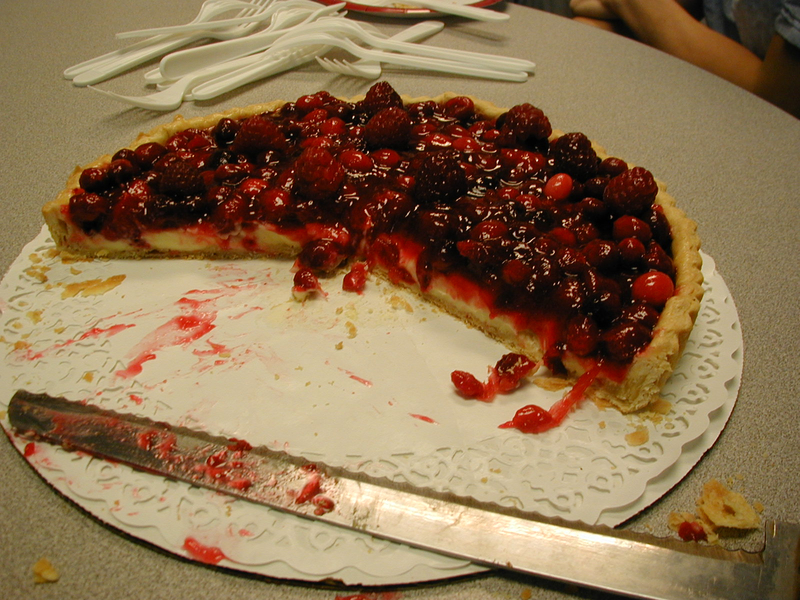 One of our cacklers walked away with an entire slice. Try as she did it took several days to complete it. We had quite an assembly for this cake but managed to use up only five of the pieces. Imagine our surprise when the next day there were another five slices gone. Apparently it was not too much to handle for some of the after hours crowd. The next day we tried again but found it slow going. Only an hour later though almost all of the remaining five pieces were gone. Who was pigging out on this cake? In reality no one. 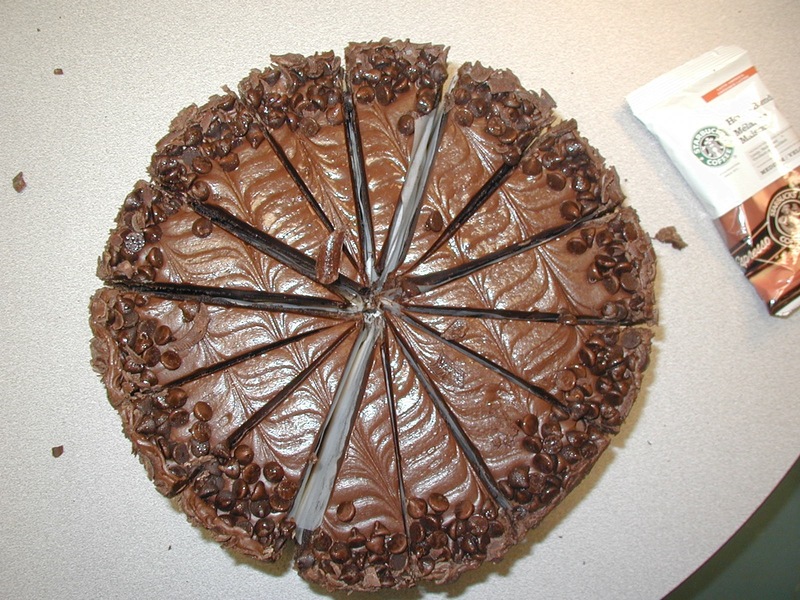 The person who brought it ended up taking some slices back to his abode to share with some colleagues. 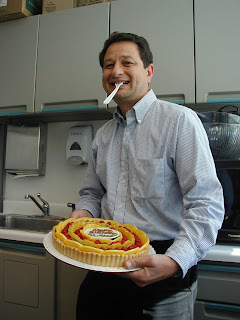 Since the paid $60.00 for the cake - a cake hour record - we presume he wanted to get a little more bang for his buck. We had no problem with that and appreciated the fact that it ended up getting the cake out of here that much faster! Two days later...all that remained! We've had many of the fruit tarts or flans or whatever you want to call them from Pastiche on Federal Hill in Providence, one of our favorite bakeries. Most of the time they are adorned with sliced fruit in a pretty pattern and of course finished with a glaze to hold the fruit in place. 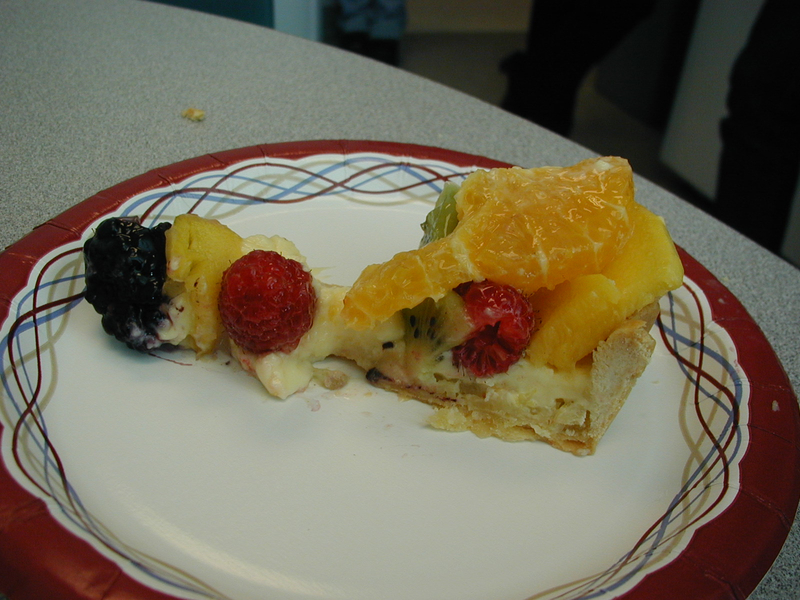 The fruit is usually chosen to create a colorful presentation and usually consists of berries, mango, and kiwi - you know - things with contrasting colors. 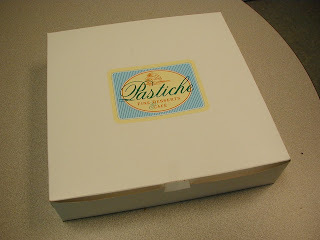 Always a favorite ..something from Pastiche! A few raspberries for flourish! 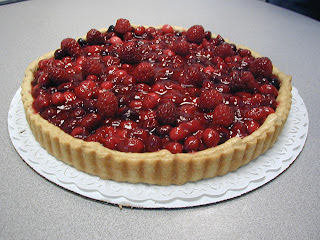 The glaze and the pastry cream helped the tart from being too tart! 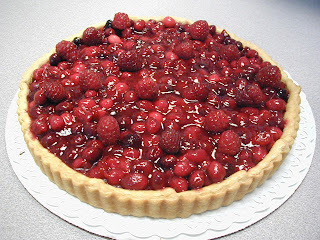 Imagine our surprise when this time around the tart is covered to the max with a mix of raspberries and many, many cranberries. Yep, I mean cranberries. Granted this is the cranberry season but given that they tend to the sour side their prolific use on this cake was quite audacious. We imagined we would all be going home with puckered lips from the sourness but that did not turn out to be the case at all. The glaze was just sweet enough to offset the cranberries which did provide a tang. 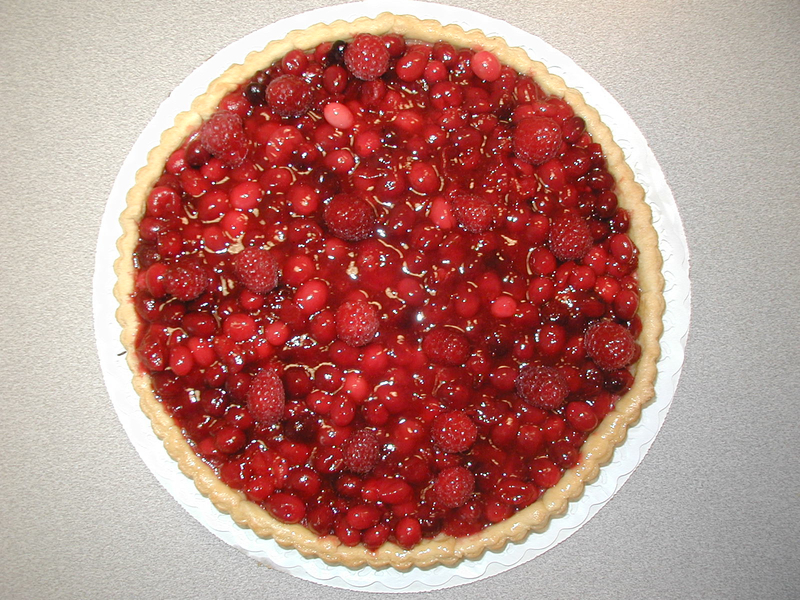 That tanginess was further moderated by the raspberries and the pastry cream below the fruit. So despite the belief that because of the cranberries this could turn out to be a miss it was indeed a hit. One of our newest colleagues hails from France as in Vive la! 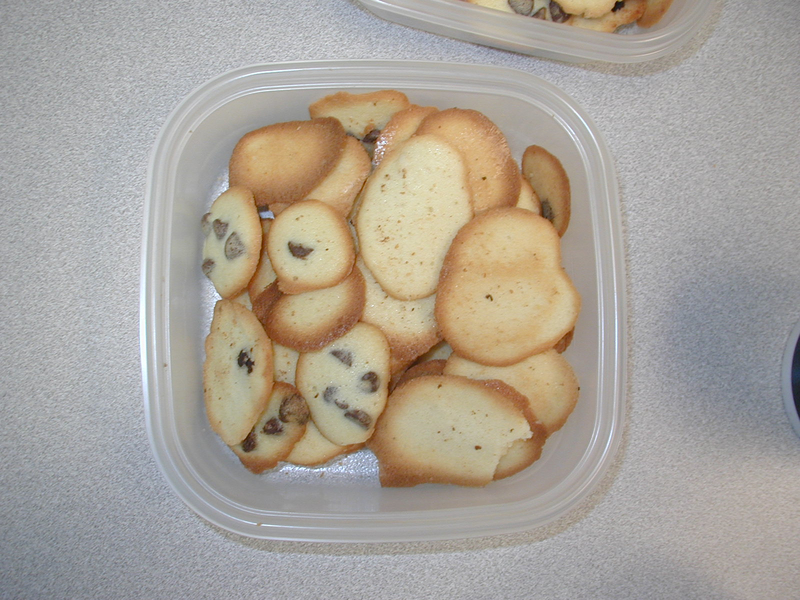 For one of her first contributions she reached to a French recipe. How appropriate! This was a yellow cake with many layers and homemade chocolate frosting. 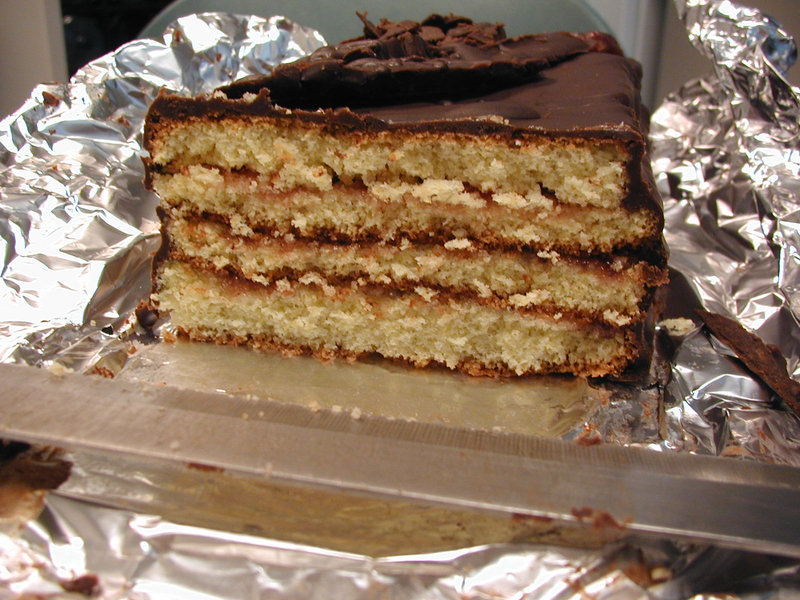 Despite the disclaimer that the cake did not rise correctly in fact the layers looked pretty good. The cake was a little squat so squeezing all four layers into it is an impressive accomplishment. 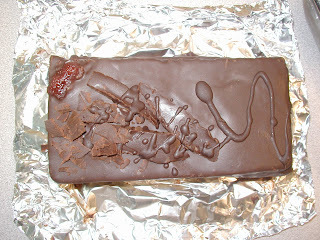 Of course the best part was the decorative chocolate "art" on the top of the cake. Not content to leave it a plain surface the cook used decorative shards, shavings, drizzle and a dollop of fruit to embellish it in a very modernistic way. This is the kind of thing that contemporary pastry chefs do. 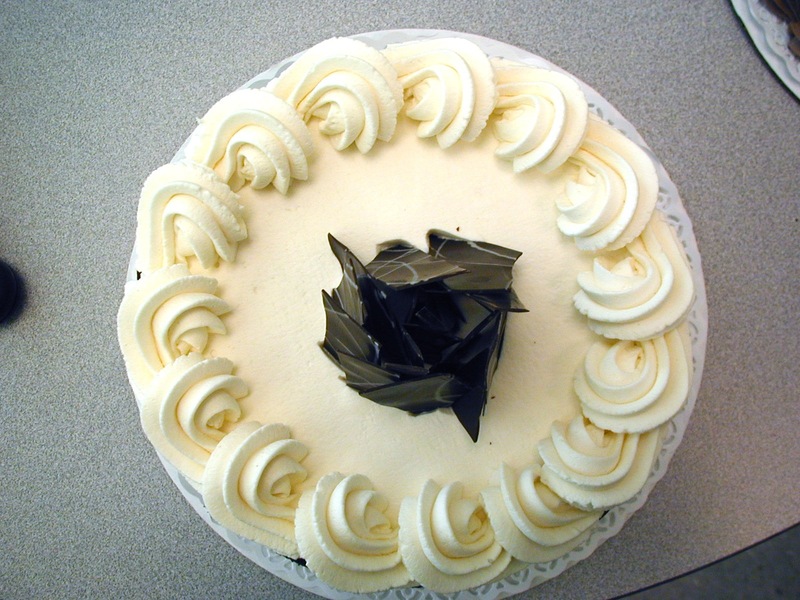 Throw conformity and all those florets to the wind and be creative with your cake decorating. It's definitely imaginative and probably a lot easier because you don't have to get out one of those pesky pastry bags. 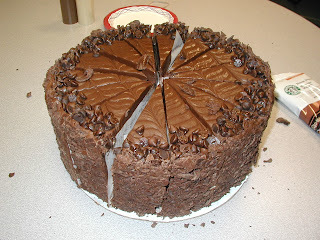 The cake certainly tasted good and the chocolate was great. As a bonus we got a French version of chocolate chip cookies both with and without the chips. 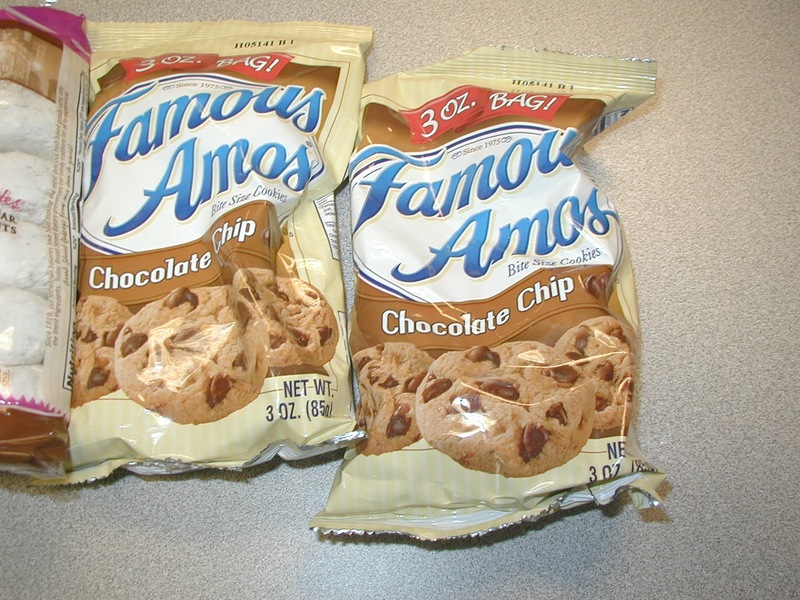 As in the case of most Euro-treats these were nowhere near as sweet as the American version but we won't quarrel with an American classic. We enjoyed these extra tidbits with the artful layer cake and were impressed with the first cake offering of our new colleague française! A lighter and less sweet version of the Toll House! 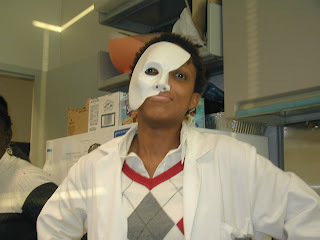 He's here, the Phantom of the Opera!! 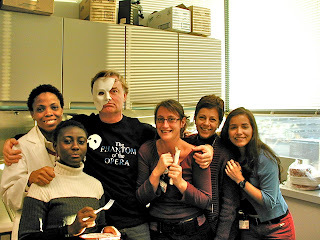 In September 2010 the rights to perform Andrew Lloyd Webber's "The Phantom of the Opera" became available to amateur groups only, i.e. high schools and colleges. The Braintree High Theatre Guild in Braintree, Massachusetts became the first public high school in Massachusetts to perform this internationally recognized piece this month. 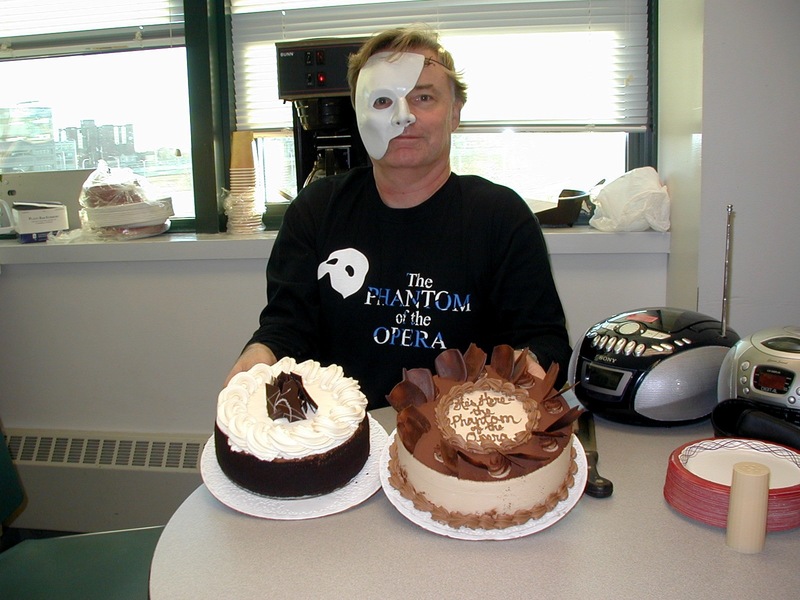 The director of the program and this production of the Phantom is one of our own cake hour friends. (In fact if you wonder why there has been a paucity of posts in the last eight weeks it's because he was headed off to rehearsals and everyone else was too lame to keep it going.) But I digress! Anyway, since so many colleagues are supportive and appreciative of the arts and have decided to attend the show, a cake hour reception is held every year to thank them all for the support. This year there clearly was a phantom theme! The Phantom requests the honor of your presence! 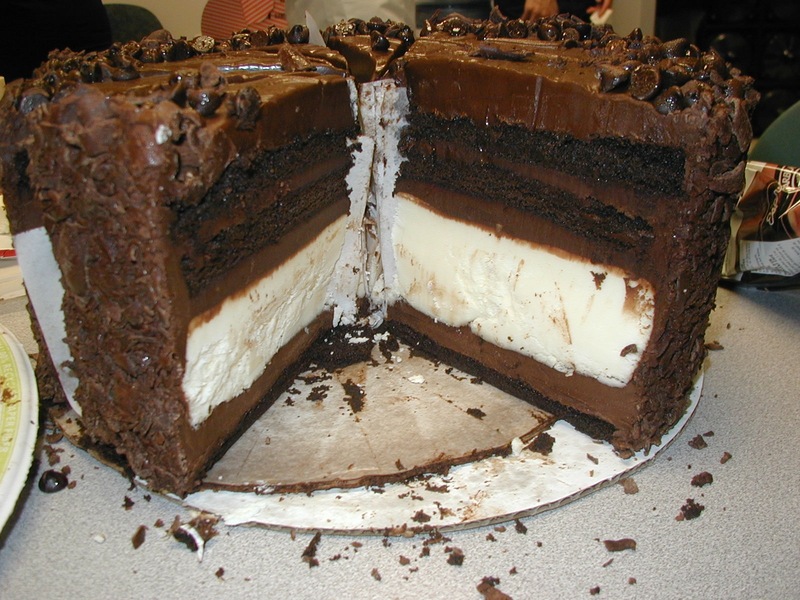 A killer chocolate mousse cake. Now that's a chocolate mousse! The phantom charms the ladies - but none of these sing! The treats were from Pastiche Bakery which is getting a lot of our attention since Ursula's closed!! 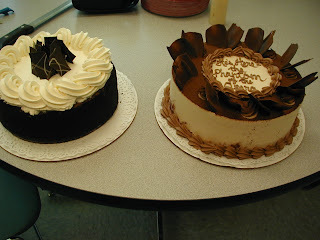 We had two creations - a mascarpone torte or cake version of tiramisu and a chocolate mousse cake. As the latter was covered with whipped cream it was, of course, bound to be a hit. Both were delicious of course. 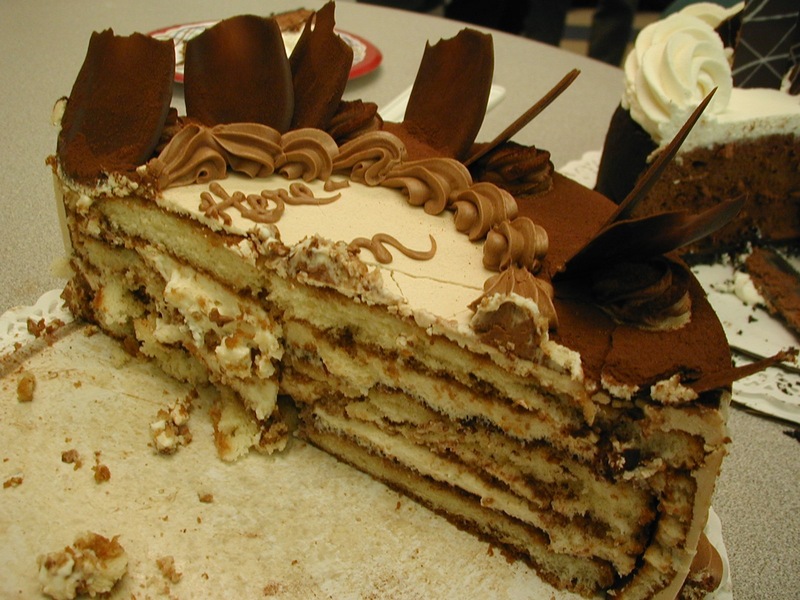 The mascarpone torte was lighter than expected and was indeed reminiscent of tiramisu. I think we are spoiled by the many tiramisus that we have had that were homemade by our Italian colleague. 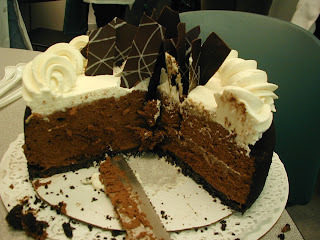 The chocolate mousse torte was fabulous as usual. 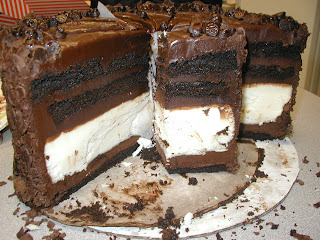 It has an oreo like bottom, a very dense dark mousse and of course real whipped cream. 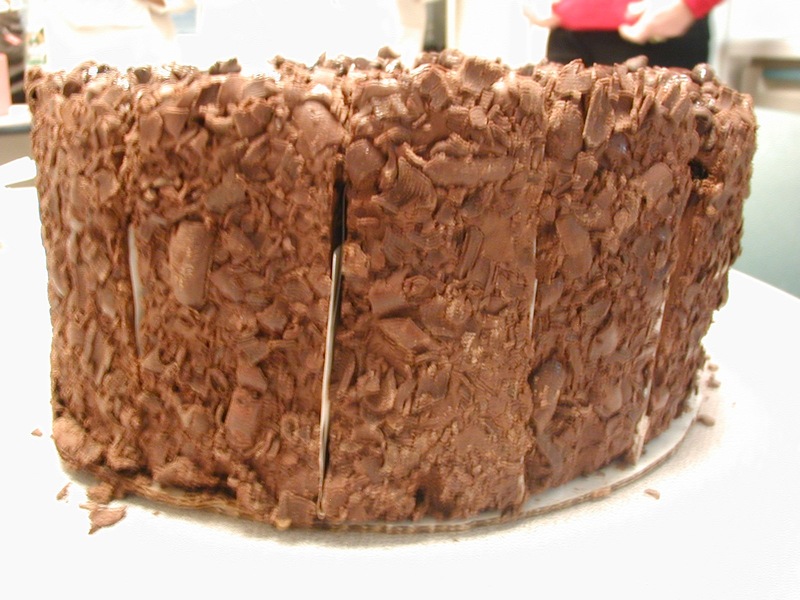 It is a signature chocolate mousse cake and sets the standard for just about every other one. 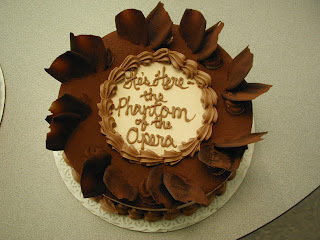 We enjoyed both as we listened to the music of the Phantom from the original cast recording. The show in Braintree has been a big hit with an added weekend and all performances sold out. Too bad if you missed it! Happy Birthday to Dr. Moss. We were happy to celebrate his birthday and did so with one of those gorgeous fruit tarts from Pastiche Bakery on Federal Hill in Providence. 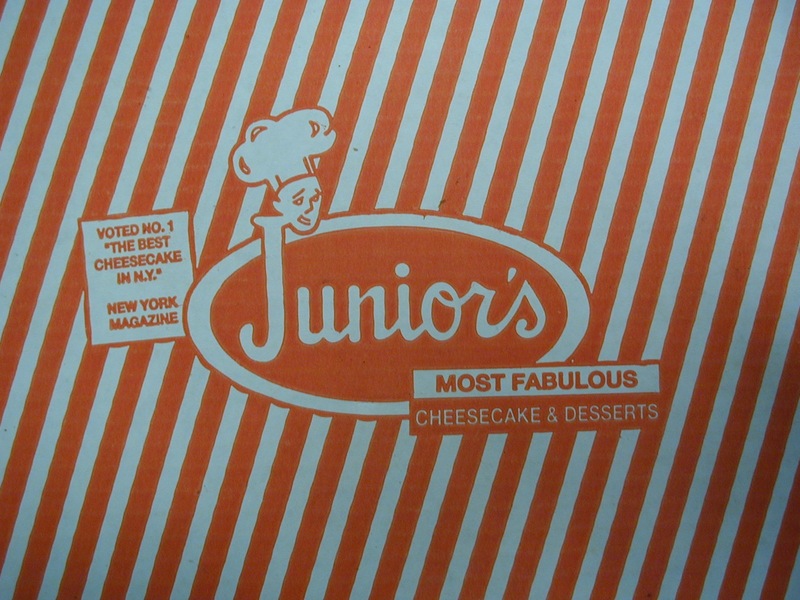 We've had quite a few creations of theirs and they are always very fresh and delicious. This particular item was no exception. 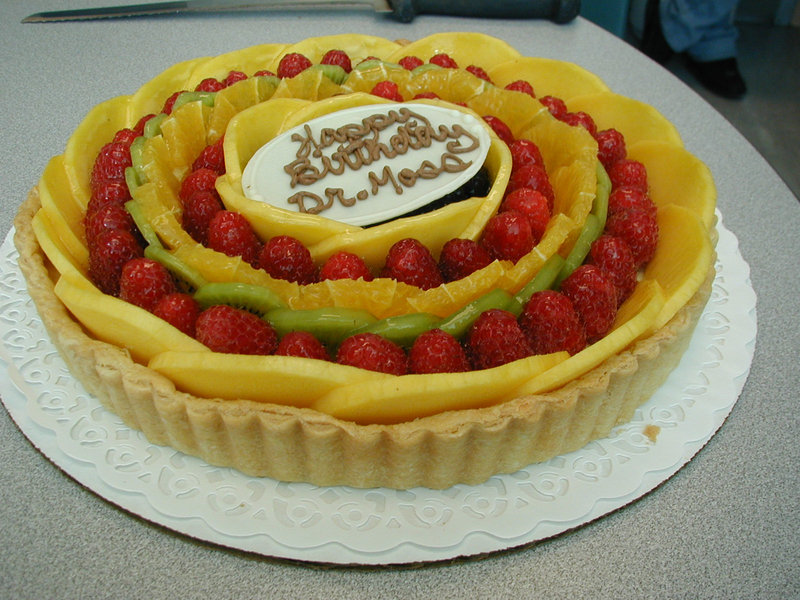 Well decorated with beautifully laid out fruit including mangos, berries and pineapple. It was almost a big tropical. 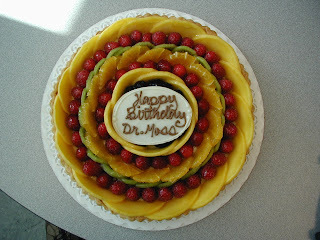 Not only was Dr. Moss celebrating his birthday but he is also enjoying his 15 minutes of fame! A report of his that describes the cost manifestations of treating people who intentionally swallow bizarre items has gone viral or as viral as anything scientific can go. To check it out follow this link to view the video. 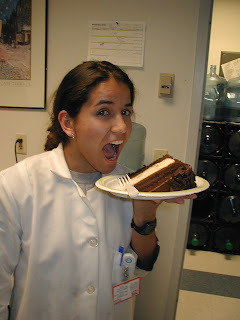 Just don't swallow that fork Dr. Moss!